On this third Sunday of Advent, we witness the prophetic call of St. John the Baptist to prepare the way of the Lord. Anton Raphael Mengs’ Saint John the Baptist Preaching brings us face-to-face with John, as he addresses us with expressive gestures. Mengs’ portrayal is intensely psychological, inviting us to encounter John’s deep conviction, prophetic presence, and sense of urgency. John’s penetrating look, coupled with his raised arms, make a burning appeal for us to listen, to look for “the one among us whom we do not recognize,” and to wait attentively for the coming of him whose sandal this prophet is not fit to untie. 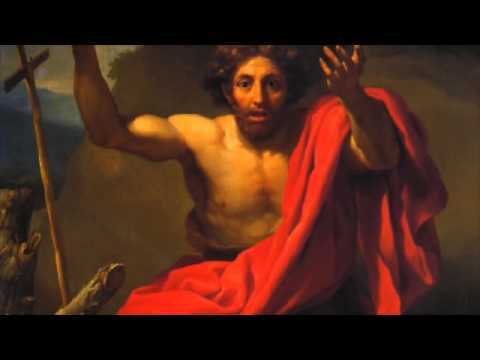 In this portrayal, Mengs dares to move St. John the Baptist away from more traditional interpretations. Rather than the heroic portrayal of a martyr, the serene portrayal of a devoted servant recognizing the Lord, or a dutiful prophet preaching to a crowd, Mengs shows us a John who is caught up in emotion. This John is making his passionate appeal stirred by the dangerous knowledge of Christ coming, dying, and rising. In this image, John exists not in the historical moment of Jesus’ early ministry, but in the post-Resurrection reality of the Church that now awaits the final coming of the Risen Lord. The red shroud draped across his body and the cross-shaped staff to his right hint at this. The shroud is a symbol of his martyrdom, and the staff points to the crucifixion of Christ. Here John comes to us not as the wild preacher in the desert, but as the saint who has lived the whole story, who exists now in God’s eternal presence, and who intercedes for us as we continue to watch and wait. He is not the light, but he now dwells in it—demonstrated by Mengs by illuminating his body brightly from above. St. John’s intercession is as intense as his preaching was—a voice that is still crying out with urgency, this time for the Lord’s Second Coming. His urgent voice comes before God filled with love for the Body of Christ, a love that seeks desperately to rouse this Body to readiness.